Theres a lot to the carpet cleaning business that most people don’t know of think of. From how the services work to how the office is run to how they come up with those ridiculous prices to how the company was started. Knowing what happens behind the scenes can better prepare you for your next carpet cleaning and enhance your knowledge about carpet cleaning. 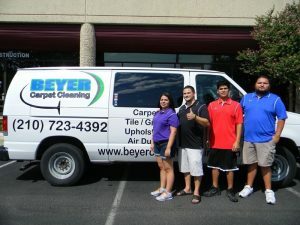 Beyer Carpet Cleaning was started by Joshua Beyer and his wife Christina. They started this family owned business of carpet cleaning, tile and grout cleaning, and upholstery cleaning in the Spring of 2013. They wanted to be free to work as they pleased and to be more flexible for their growing family. After much research and speaking to professionals Joshua thought carpet cleaning would be the easiest industry to get into that could be profitable if done right and would be the easiest to maintain. So after filing their paperwork with the state of Texas and Bexar county they started putting the pieces together in order to have a successful company. They then purchased their first van, equipment, and materials to service the potential carpet cleaning customers. They had the van wrapped with their company name, Beyer Carpet Cleaning, logo, services offered, website, and telephone number. Simultaneously, they had hired someone to put up a professional website so customers could easily find them. As everything came together rather quickly the phone calls started rolling in. They had advertised low carpet cleaning prices in order to catch the eye of shoppers. Their advertising was working and phone calls were coming in but they need more business so they hit the streets of San Antonio. After having several thousands door hangers produced both Josh and Christina went door to door in several neighborhoods leaving these door hangers which believe it or not helped boost business. They tried other methods like free online directories, mailers, and contests through Facebook which they learned were not as successful. They also put up free ads on Craig’s List which was bringing in the most business at the beginning. After learning what worked and what didn’t in advertising business was in full swing and by the summer time they were turning down jobs because they were so busy. Soon they would have to hire extra help to maintain the office and services. Beyer’s office consists of the owners Josh and Christina as well as one other admin, a lead technician, and several assistants on the service side of the business. Josh believes in paying his technicians a fair commission for each job they service. Helpers get a fair wage for each job they assist in servicing. Carpet cleaning is not an easy job. It requires a lot of strength to pull down hoses from the van, to moving them around through out a home or business, and then putting them away. Not only are they moving around hoses they are using a somewhat heavy tool to do the actual cleaning and switching it out several times depending on the size of a job. The techs are also carrying all these hoses and tools up and down stairs at least 2-4 times a day. On top of the equipment the techs must properly fill out invoices with the customer’s info, total, signature and collect payment. They also have to go over every detail of stains that may not come out, additional services such as pet treatments or red dye removal, odor issues, and anything else that could be wrong with a customer’s carpet. Then they have to deal with the customer. Some customers are easier to deal with then others but none the less every customer is treated fairly and will receive excellent service. Besides taking care of their employees and customers the owners must also properly maintain their equipment and vehicles. They must have each vehicle properly stocked with every kind of tool and solution that may be needed to complete a job. Vehicles must be in top notch condition so that means car washes, frequent oil changes since the vans are running all over town all day Monday thru Saturday, many fuel fill ups a week, and any other maintenance the van may need. Equipment to perform carpet cleaning must also be regularly maintained. If not the potential for an explosive generator is very high and dangerous. As you may have gathered the cost of maintaining vehicles and equipment, stocking vehicles to do the cleaning, and paying employees all factor into the cost of your carpet cleaning. Many of our bigger competitors factor in the above plus their advertising expenses and double, triple, or even quadruple the cost of carpet cleaning to cover all of their expenses and to bring in a profit to their business. This means cleaning your entire house could cost you anywhere from $250-$400 easily depending on which big name you call. Beyer Carpet Cleaning has expenses to cover as well but their advertising overhead is no where as much as the big corporations. Beyer Carpet Cleaning uses the same professional equipment and solutions and the big guys but because their advertising department is much much much smaller they can pass along the saving to their customers. 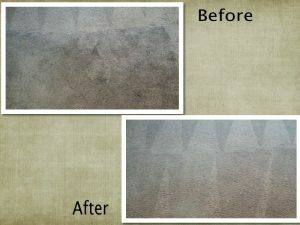 The average cost of carpet cleaning, tile and grout cleaning, and upholstery cleaning with Beyer is between $100-$200. 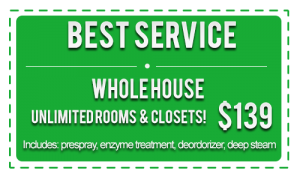 This is the best price in San Antonio for the quality cleaning your are needing. If you use Beyer Carpet Cleaning you will not be disappointed.